Atelier de l’Île, in Val-David, Quebec, is presenting my solo exhibition Monotypes récents, from October 1 to 24, 2013. 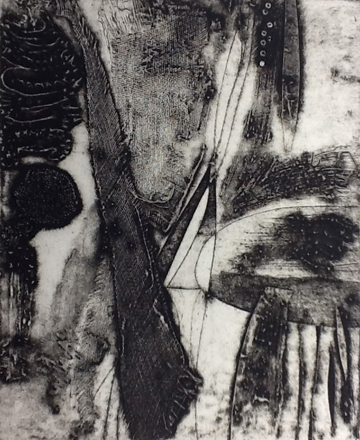 I was introduced to the monotype technique by Hannelore Storm, in my first printmaking class at l’Université du Québec à Montréal, thirty years ago. It is a medium I gravitate to constantly and practice with great pleasure. Often I use the technique to spur new ideas and approaches. I might make a series of monotypes as an interval during a complex collagraphy project. Or I may experiment with new inks, tools or methods, with a view to enriching my teaching repertoire. 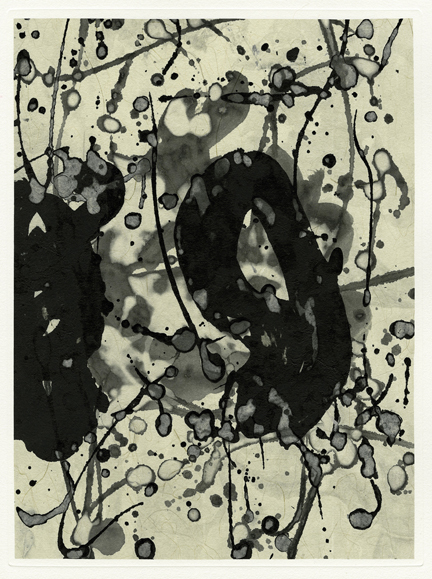 In either case, I am drawn to the intuitive process inherent to the monotype process. 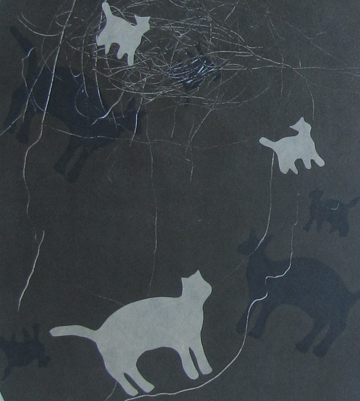 Talleen Hacikyan, detail from Cat Tales, monotype, rolled layers and stencils. I work in layers, building the surface with opaque and transparent color. I usually work on several images simultaneously, taking advantage of ghost or second impressions from the same inking, allowing me to play with different tonal expressions of the same image. Monotypes récents, my first exhibition entirely dedicated to the monotype, presents nineteen pieces. 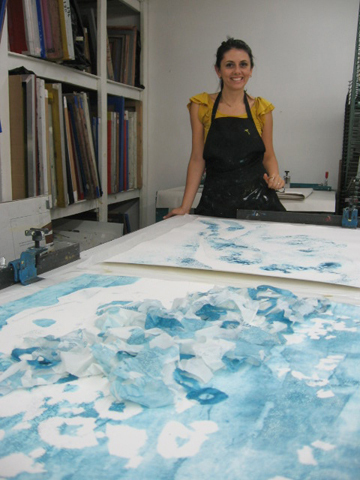 Talleen Hacikyan, Traces de toi, monotype. I originally created the Baisers series for the exhibition Le Baiser organized by Atelier de l’Île in 2013. 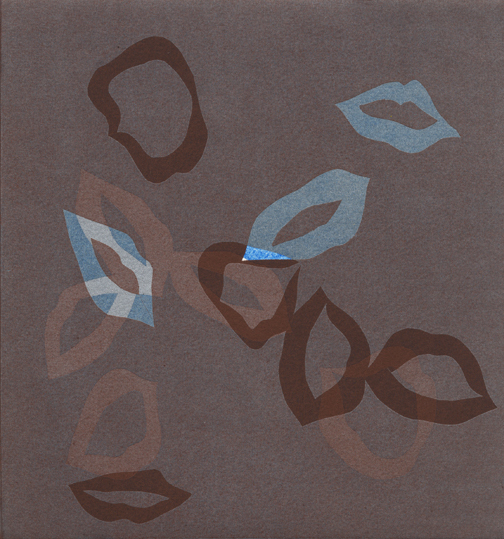 These prints were made with rolled layers of ink and stencils made of impressions of my lips. 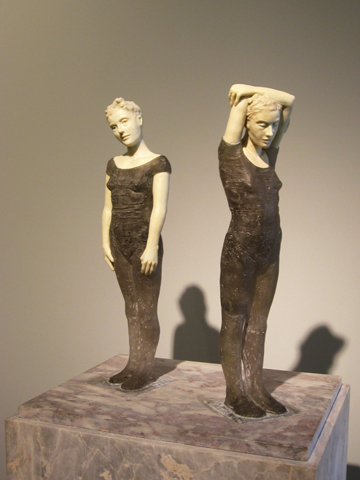 Dual Torso series at Atelier de l'Île. In the Dual Torso series, the stylized female figure is represented in diptychs. Each pair of torsos expresses a duality where the figures echo each other. 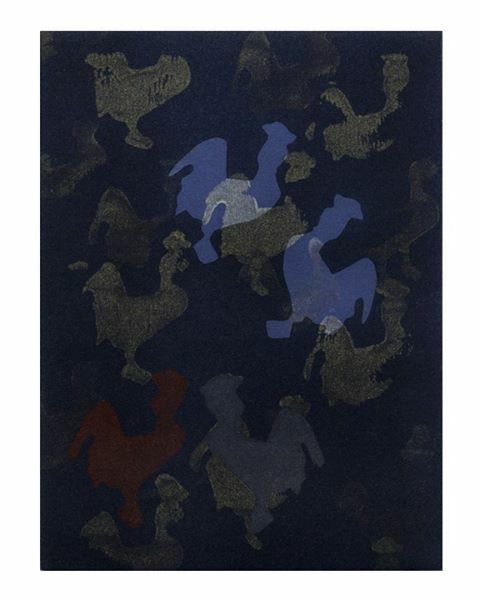 Talleen Hacikyan, Coqs nocturnes, monotype. 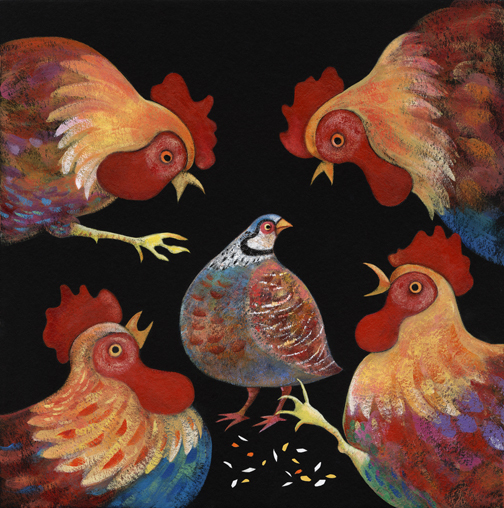 Cat and Rooster series with the original animal cut out stencils. 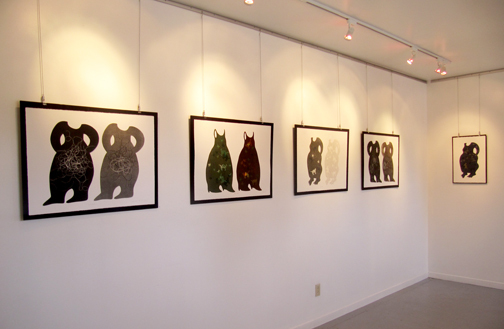 The Cat and Rooster series were made with stencils and rollers that I fabricated with wooden dowels and adhesive foam animals. The toy forms and the rolling process let me adopt a playful approach that suggests poetic narratives. 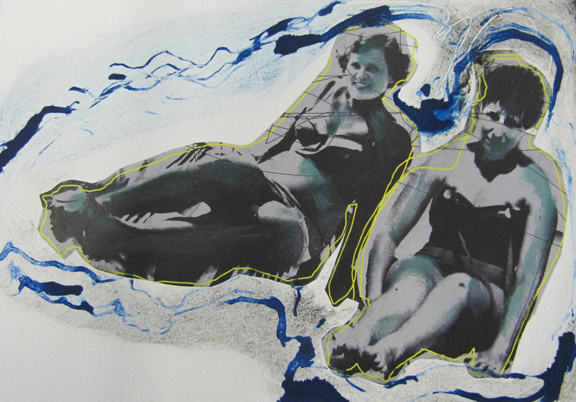 Talleen Hacikyan, Wavy Journey, monotype. 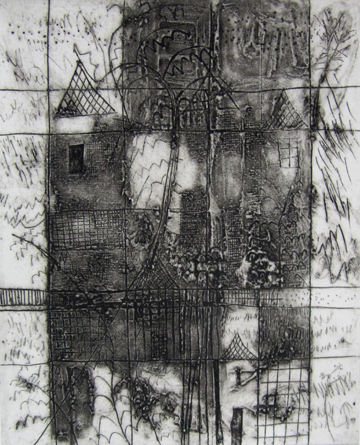 Also included is an earlier series of monotypes made with encollage of painted elements, on the theme of home. Vernissage Saturday October 12 at 2:00 p.m.
Vernissage at BIECTR. Photo by Olivier Croteau. The Biennale internationale d’estampe contemporaine de Trois-Rivières is an extraordinary event. On July 4th I hopped into my car in Montreal, cruised under picture perfect sunny skies despite the storm warning, and in two hours flat, found myself marveling at spectacular prints. Musée Pierre-Boucher. Far wall: Grosse tête cintrée series by François Morelli. Photo: Félix Michaud. The BIECTR, one of the most important international printmaking competitions in Canada, has been taking place every two years since 1999. Its mandate is to promote contemporary printmaking and to celebrate the diversity and current trends of this medium as they are expressed around the world. The quality of its presentations along with the impressive list of parallel print related exhibitions and activities make BIECTR a unique event in Canada and in North America. Musée Pierre-Boucher. Photo: Talleen Hacikyan. 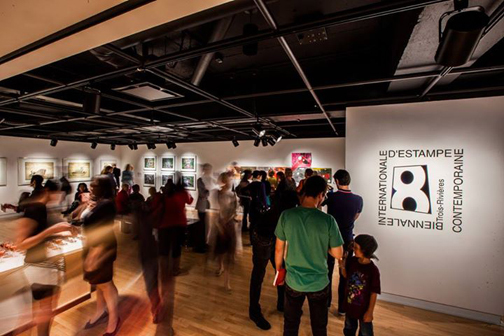 The BIECTR showcases 58 artists from 22 countires exhibiting 330 prints in 4 venues: the Centre d’exposition Raymond-Lasnier, the Galerie d’art du Parc, the Musée Pierre-Boucher and the Old Rail Station. 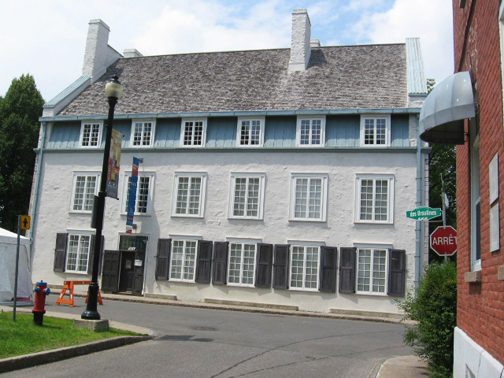 This art circuit, along with the parallel exhibitions, take the public on an enchanting tour of the historical centre of Trois-Rivières. L’Ancienne gare ferroviaire de Trois-Rivières. Photo: Félix Michaud. Each artist presents four to seven prints. There are also a few print based installations. The works have been grouped together according to themes that deal with politics, history, nature, story, and memory. The texts accompanying the groupings, written by Jo Ann Lanneville and Élisabeth Mathieu set the tone for responding to the work and are thought-provoking. I spoke with Jo Ann Lanneville, President of BIECTR. I asked her if different tendencies emerge from one Biennale to the next. She confirmed my supposition and said that this year there were many submissions of work dealing with the road trip experience and questions of identity as it refers to place. 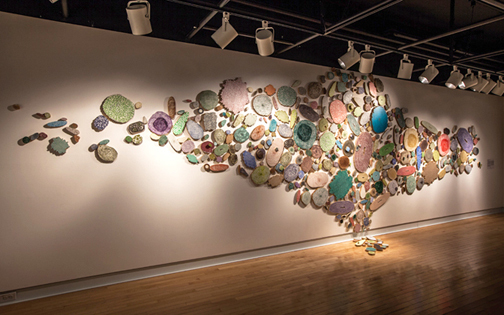 Many works also express a preoccupation with sociopolitical and environmental issues. Jo Ann pointed out that there are several mezzotint prints this year, including those of Thai artist, Kraisak Chirachaisakul, the Grand Prize winner. La Galerie d’art du Parc. Photo: Talleen Hacikyan. Visiting BIECTR is like going on a treasure hunt. With my map in hand, I walked from venue to venue, at a leisurely pace, reflecting on the art I had just seen, catching the sites along the way and anticipating the next exhibition. Each space has its own character. I loved visiting the Galerie d’art du Parc, housed in the charming Manoir de Tonnancour, built in 1723. 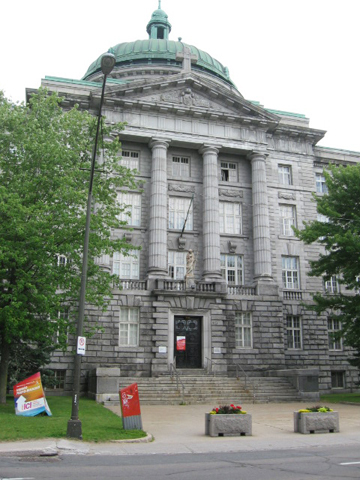 This year BIECTR features a new venue, the Musée Pierre-Boucher, the museum of the Trois-Rivières seminary. This peaceful space, that houses a beautiful chapel, is conducive to reflecting on the art. 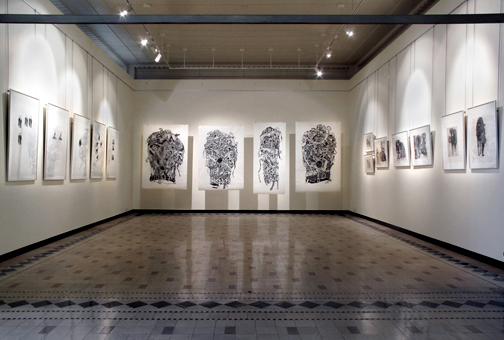 Marilee Salvator, Growth Patterns, Etching, lithography, digital printing, wood, 259 x 988 x 5 cm, 2010 -2011. Photo: Olivier Croteau. My favorite piece in the Biennale is Growth Patterns by American artist, Marilee Salvatore. She has combined etching, lithography, digital printing and wood to create this magnificent installation. I sat on a strategically placed bench across the piece and admired the play of colorful cell-like shapes, growing into a tree that suggested a human form. My whole body connected to this piece as my eyes danced over the 3D surfaces. 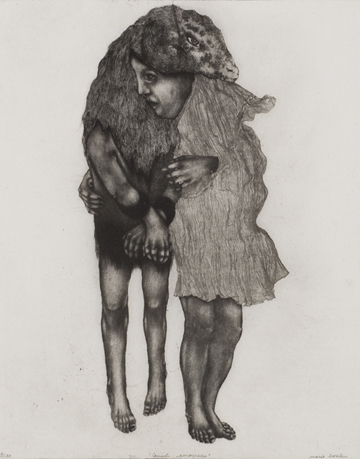 Pascale Parrein, Anatomie subjective III, Etching, 69 x 50 cm, 2011. Photo: Guy Langevin. 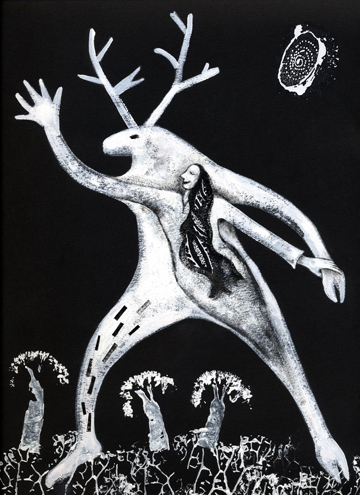 I was also drawn to the Anatomie subjectives series of etchings by Pascale Parein, from France. Inspired by old encyclopedia illustrations she depicts parts of the body and internal organs filtered through her own emotional lens. The heart, the womb, the lungs become metaphors for sentiments and states of being. 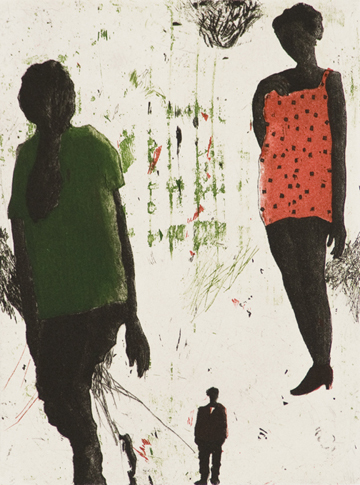 Marie Boralevi, Camisole amoureuse, etching, aquatint, soft ground, dry point, 61 x 48.5 cm. 2012. Photo: Guy Langevin. French artist Marie Boralevi draws us into her fantastical world where people and animals interact and converge in a theatre of the absurd. Camisole Amoureuse is sublime. 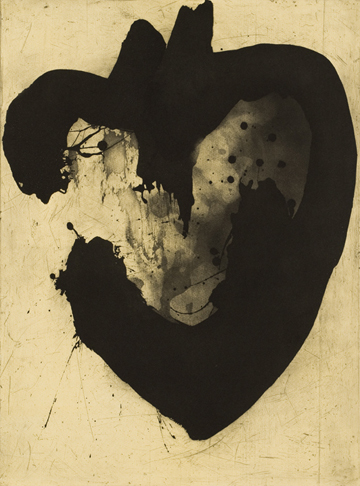 Eric Pina, Trois présences, aquatint, etching, 40 x 30 cm, 2012. Photo : Guy Langevin. The etchings and aquatints of German artist Eric Pina are wonderful examples of how the language of the medium enhances narrative content. The scratches and stains created by the acid biting into metal plate go a long way to creating the atmosphere surrounding his beautifully executed figures. The juxtaposition of characters suggests many possible stories. Liena Bondare, Cycle Empty Room V, Silkscreen, 46 x 68 cm, 2008. Photo: Liena Bondare. Liena Bondare, a young artist from Lithouania, examines the relationship between memory and place in her Empty Room series of silkscreens. She depicts empty, classrooms, motel rooms, offices and apartments while conveying the spirits and energies of their secret memories. Her sketchy lines, subtle layering of pale colors create a contemplative effect. 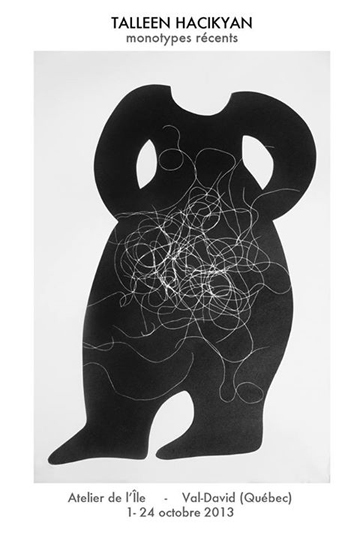 François Morelli, Grosse tête cintrée II, Relief print, 185.5 x 84 cm, 2012. Photo: Didier Morelli. The Grosse tête cintrée seires of large relief prints by Quebec artist, François Morelli, is noteworthy for its powerful and intricate graphic treatment. The mask-like heads, suspended from the ceiling, exude a spiritual presence. 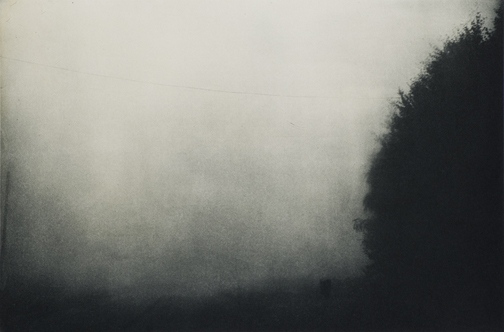 Janne Laine, Forgotten Journey III, Heliogravure, aquatint, 64 x 85 cm, 2011. Photo: Guy Langevin. The Forgotten Journey series of heliogravures and aquatints by Finnish artist, Janne Laine, are significant for the dreamlike atmosphere of her minimalist landscapes. They are imbued with a soft haze of memories, familiar yet distant and fleeting. Driving home to Montreal at the end of the forever sunny afternoon, my head was ablaze with a potpourri of prints. I felt a connection to printmakers from around the world. I reflected on how we have converging sensitivities and preoccupations and how the age old medium of printmaking creates an affinity between us. The BIECTR is a major manifestation of our Global Art Village and a must-see for print lovers, from near or far. BIECTR runs through September 8, 2013. Free guided tours are available for groups of five or more, by calling 819-370-1117. On August 14 after sundown at Place de l’Hôtel-de-Ville there will be a projection of films on printmaking. Belgian artist Michel Barzin will present his two short films. A documentary film will also be featured. Special thanks to Jo Ann Lanneville et Élisabeth Mathieu for their collaboration. 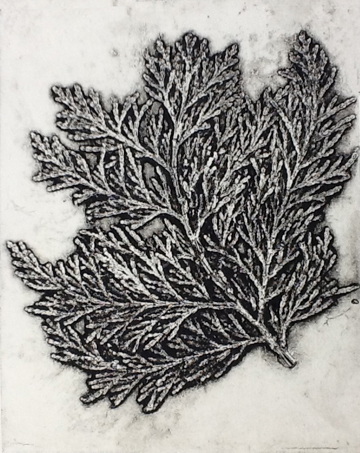 On June 21 and 22, I taught an intensive two-day collagraph printing workshop at the Printmaking Center of New Jersey (PCNJ), in Branchburg, New Jersey. After my whirlwind art tour of New York it felt wonderful to find myself amidst the green rolling hills, horse farms and quaint villages in this scenic region. 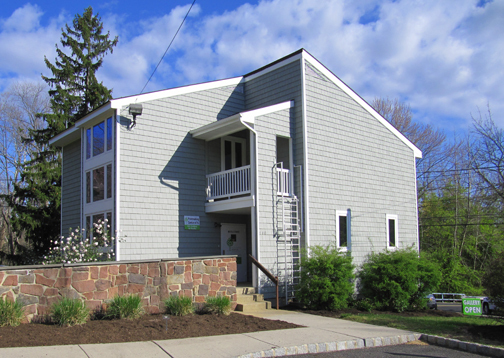 The Printmaking Center organized a home stay for me with artist Liz Mitchell, who is the Board Chair of the PCNJ. My encounter with her, visiting her studio and seeing her art were bonuses to the already enriching experience of coming to teach at PCNJ. I had the pleasure of working with six women artists, including one returning student from the first workshop I gave there last year. With only two days to make collagraph plates and to print them, there is no time for participants to ponder over image content. This is good. It pushes them to jump right in and get an intuitive grasp for the medium and to disregard any tendencies toward self-censorship. The atmosphere in the studio was warm, welcoming and positive. The women started by practicing subtractive methods on their prepared cardboard plates: dry point, X-Acto knife and tearing. They went on to explore additive techniques: collage, plaster, acrylic gel and carborundum powder. After these directed exercises they were free to create more plates combining all these techniques according to the effects they wanted to achieve. I gave a printing demonstration, according to traditional methods handed down to me by master printers. 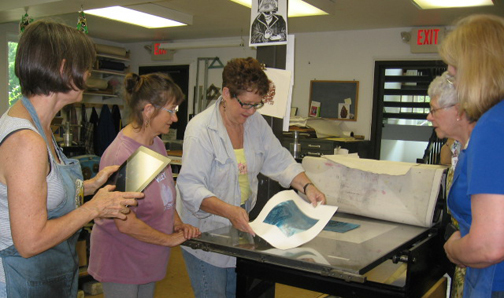 After we all witnessed the magic of the first printed collagraph hot off the press, everyone grabbed a smock and latex gloves and got to the exciting business of printing their plates. 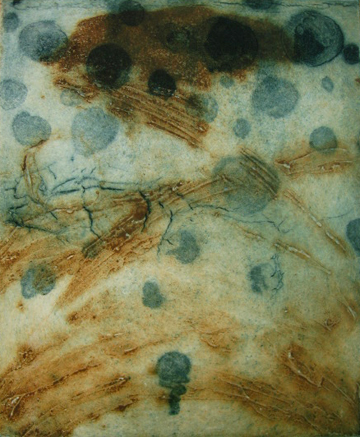 The first collagraphs were printed in black to get a true grasp of tonal effects and then we dabbled in color. I love the organic process of teaching and learning that happens on the spot. Often the best tools I have to explain techniques are generated by the student work itself. Each print becomes my teaching assistant. The women had brought interesting materials to create textures with: antique lace, surgical tape and Band-Aids, dried flowers, microscopic beads, copper shavings, sawdust and evergreen clippings. Everyone was struck by the versatility and expressive quality of collagraphy. Students explored different approaches. 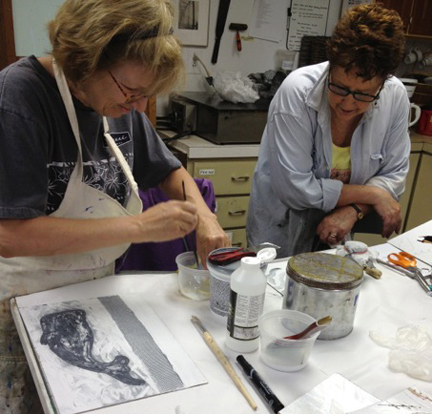 Leokadia Stanik and Judy Nylan printed two-plate color collagraphs. 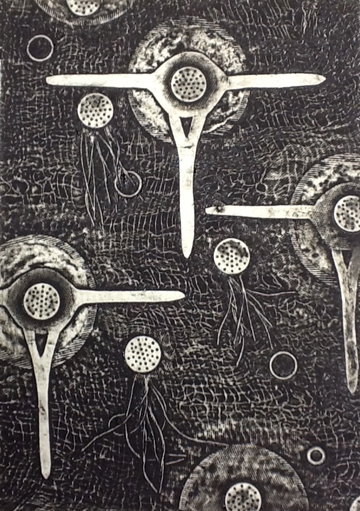 Judy Nylan overprinted a silkscreen with a collagraph plate and Judy Tobi made several prints using her own hand made paper. During a two-day workshop my immediate goal is to teach the basics of collagraphy and to convey the unlimited possibilities of this wonderful technique. I also want to inspire students and encourage them to continue exploring the technique on their own. Ultimately, when I teach, I strive to create an atmosphere where participants connect to their work, to each other and feel joy. 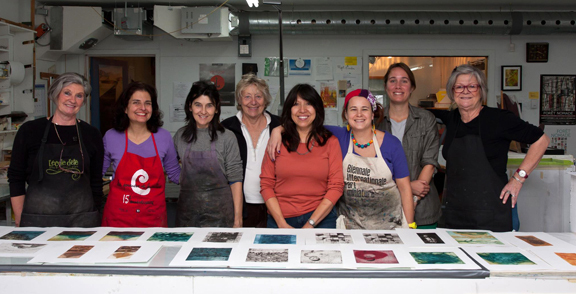 I am lucky to be part of this dynamic where printmaking becomes a celebration of life. Thank you to Linda Helm Krapf, Sheila Goloborotko, Liz Mitchell and to all the students. Photos by Sandy Anton, Talleen Hacikyan, Matt Koosner and Leokadia Stanik. Thanks! 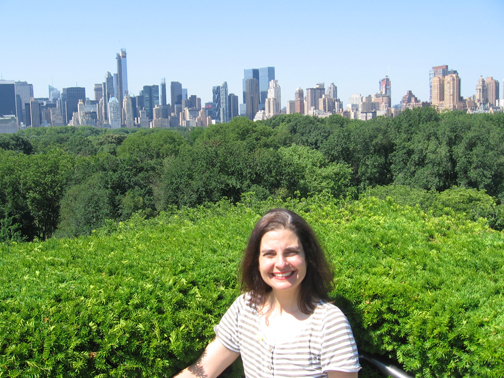 I just returned from a fabulous five day trip to New York, New Jersey and Philadelphia. 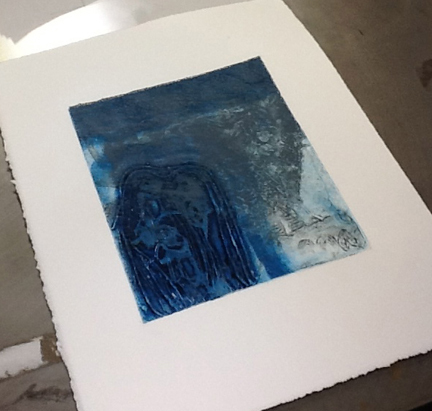 The main motive for going south of the border was to give a printmaking workshop at the Printmaking Center of New Jersey. The other destinations were self-indulgent bonuses I added to my itinerary. Instead of traveling by day on Thursday I gained a day by joining the flock of twenty-somethings on Wednesday’s night bus. When our Greyhound pulled into Port Authority bus station at 7:00 a.m. any lack of sleep was overridden by the instant surge of adrenaline that New York injects into me. My first job at hand was to visit the Metropolitan Museum of Art. 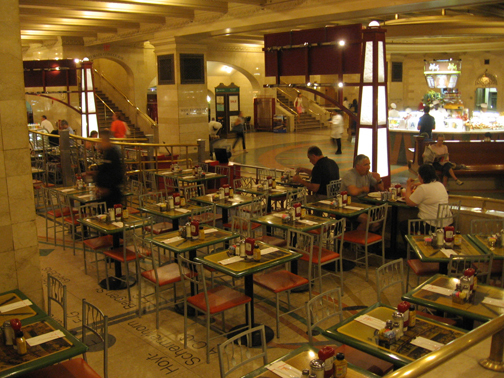 My claim to fame is that I was the first person to step onto the marble floor of the Met that morning. What a thrill to be the only person in room after room of treasures as I rushed to the shows on my to do list. 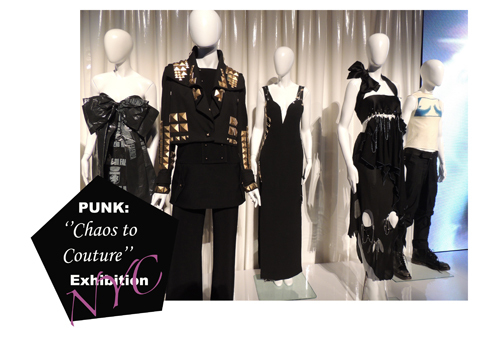 Punk: Chaos to Couture was my fun show. About 100 designs show the transformation of the the do-it-yourself ethos of the punk movement to the made-to-measure concept of haute couture. Black Armani gowns with gold safety pins, evening apparel made from shredded garbage bags and a reproduction of CBGB’s bathroom are all there for your sensory pleasure. 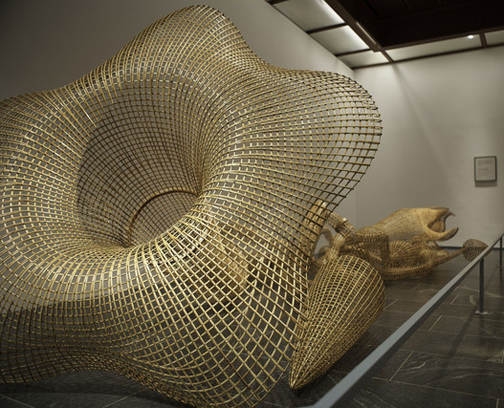 I was captivated by Cambodian artist, Sopheap Pich’s big, flowing rattan and bamboo sculptures. His organic forms, inspired by elements of human anatomy are embedded in memories of culture and place. The Ken Price retrospective was an interesting discovery for me. From the luminously glazed ovoid sculptures of Price’s early work to the molten-like slumps made in the 1990s, one gets a good picture of this American artist’s work. After my visit at the Met I met Irena, my printmaker friend. 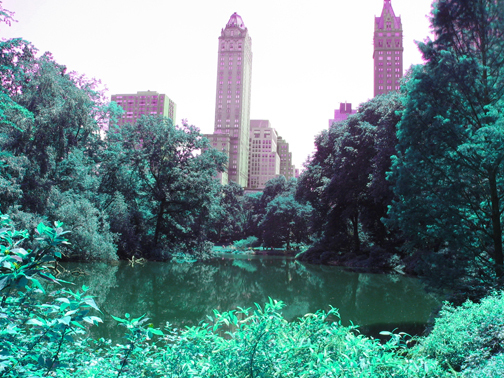 We strolled through Central Park enjoying the glorious day. Irena invited me to lunch at Whole Foods Market at Columbus Circle. This is a great food option if you want a delicious, fresh, healthy and quick meal. After saying goodbye to Irena at Columbus Circle I wondered what my next step would be. All I had to do was look up. I was standing in front of MAD, the Museum of Arts and Design. On my previous trip to New York I had come to MAD only to make it as far as the gift shop since the galleries had closed. This time the museum came to me. What a fascinating place! I visited the Against the Grain exhibit in a meditative daze and savored each of the 90 pieces with delight. The exhibition features 57 international artists, designers and craftspeople that explore cutting-edge conceptual and technical trends in woodworking today. They deconstruct shapes and play on the relationship between function and form. The video featuring talks by several of the participating artists is informative and inspiring. The Playing With Fire exhibit that celebrates the 50th anniversary of the American Studio Glass movement is a treat. One of my favorite pieces is Grey Figures by Nicholas Africano. 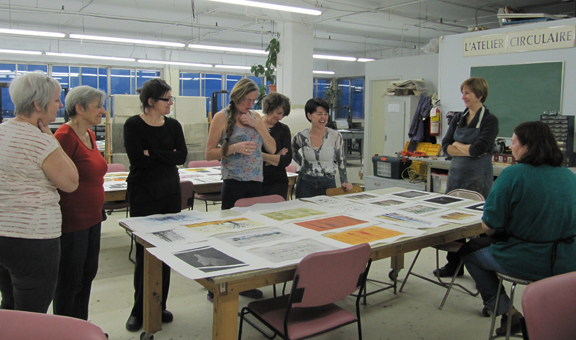 I ended my art tour of New York with a visit to the Lower East Side Printshop to see Irena’s latest collagraph prints. I met Irena Pejovik in 2011. 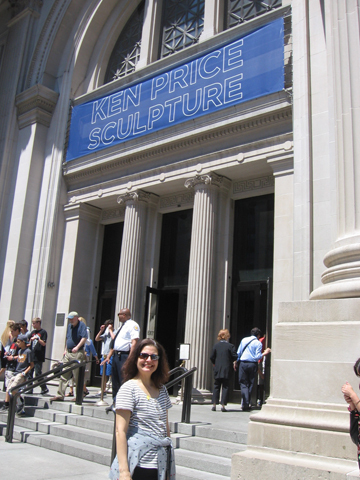 She was instrumental in introducing me to the Printmaking Center of New Jersey, where I teach. She currently has a solo exhibition at Right Angle Gallery in Hoboken, New Jersey. 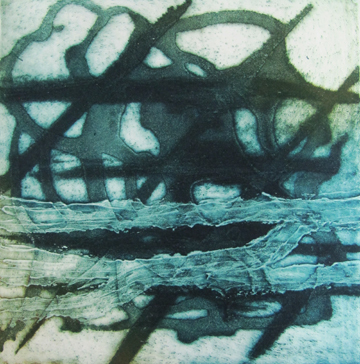 It was wonderful to see her unique and fresh approach to the collagraph medium that I love so much. By the end of the afternoon I was on a Clinton, New Jersey bound bus, saying goodbye to the New York skyline, and anticipating new art adventures. Stay tuned to the next blog as the story continues in New Jersey. 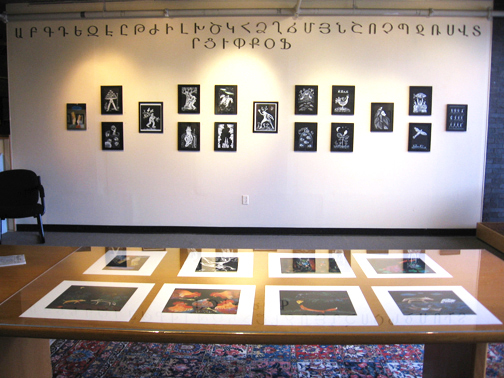 From May 22 to July 28, 2013, the Armenian Library and Museum of America is featuring a solo exhibition of my work: Talleen Hacikyan Prints and Illustrations. This is the first time that I am showing illustrations alongside of my prints. Armenian Museum and Library of America. 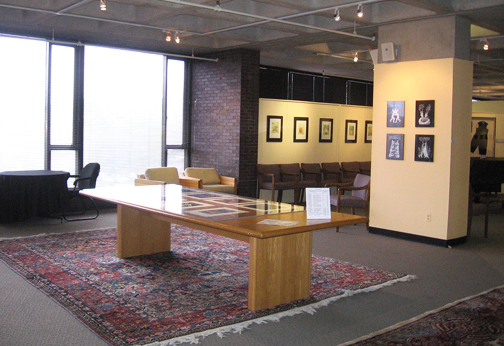 The Armenian Library and Museum of America (ALMA) is located in Watertown, in the Greater Boston area. Founded in 1971, ALMA is home to a major collection of Armenian material culture, comprising over 20,000 artifacts, such as coins, textiles, rugs, religious artifacts, ceramics and illuminations. The library holds over 27,000 titles. 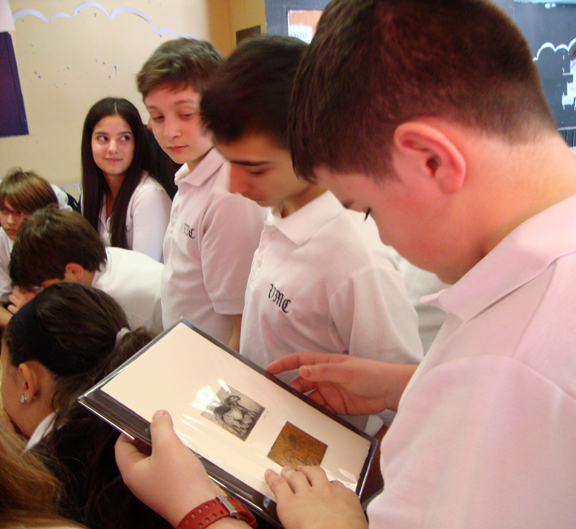 Besides being a repository of artifacts and books, ALMA is a living museum that hosts exhibitions and various cultural and literary events. Talleen Hacikyan Prints and Illustrations. My exhibition is in the third floor gallery. This vast space, with its grand piano and oriental rugs, has a warm and welcoming aura. I visited the museum for the first time on the day before the opening of my show. 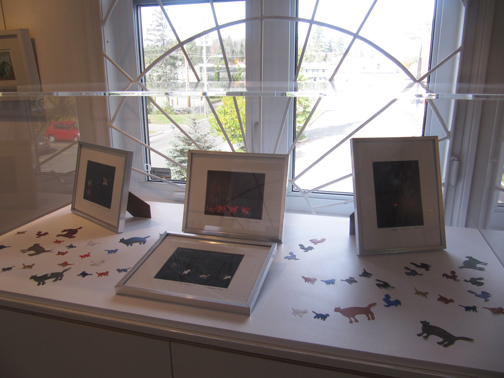 Gary Lind-Sinanian, the curator, had framed and hung my work beautifully. When I walked into the gallery I felt as if I was stepping into familiar territory. Yes, my art was there to greet me, however, the fact that I was in a building that treasures Armenian culture had everything to do with my sense of belonging. Talleen Hacikyan. Illustration for Tork Angegh. Acrylic, hand stamping, collage. 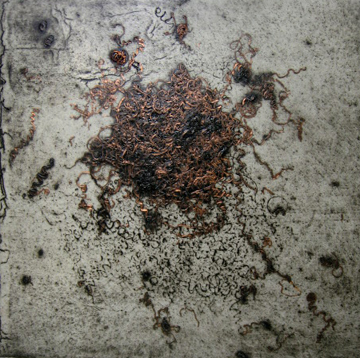 34 x 25 cm, 2007. My show features the original illustrations and digital prints from Tork Angegh and Aesop’s Fables. Tork Angegh is a traditional Armenian folktale, translated into English by my father, Agop Hacikyan and published by Gomidas Institute . Aesop’s Fables, by acclaimed British children’s author, Michael Rosen, was published by Tradewind Books and has just been released. I used the same technique for illustrating both books: acrylic paint with hand stamping and collage. The hand stamping is evidence of the printmaker in me. I printed a variety of objects, from woodblocks designed for textile printing, to leaves and broccoli. Talleen Hacikyan. Illustration for Aesop's Fables. Acrylic, hand stamping, collage, 31 x 31 cm, 2013. In order to give an overview of my work in printmaking to this new public, I am presenting three series of prints. 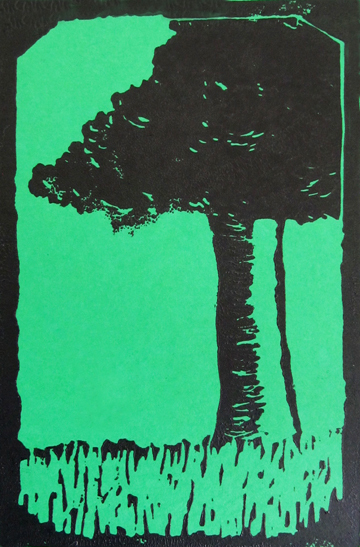 Talleen Hacikyan, untitled, linocut, 38 x 28 cm, 2011. 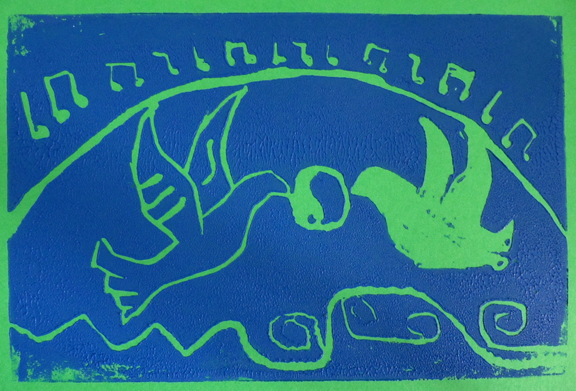 The Icarus series of linocut prints is based on the myth The Fall of Icarus. 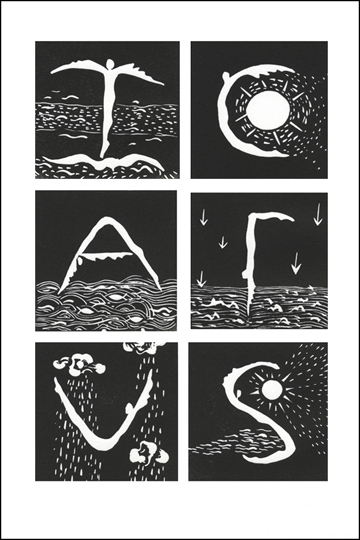 In the tradition of hand-drawn typography, each image represents a letter in the name Icarus and Icaro while illustrating my take on the classical story. Talleen Hacikyan. Be Merry and Go Round, collagraphy, 56 x 76 cm, 2009. 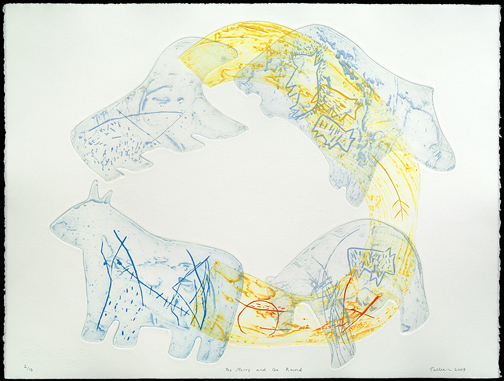 The Animal Instincts series of collagraph prints uses animal imagery to create a metaphor of human emotions, where wolves, bears, and dogs symbolize the instinctive facet of human nature. Talleen Hacikyan. 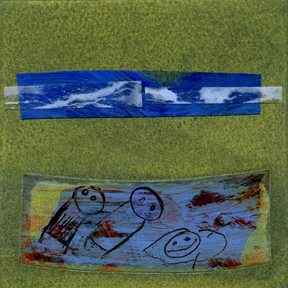 Lifesaver, collagraphy, 38 x 28 cm, 2005. 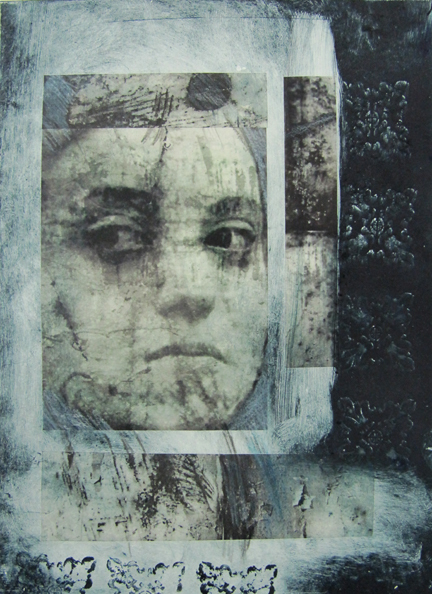 In the Open House series of collagraph prints I explore human identity as it relates to the experience of home. Homes are depicted as part of nature. The experience of home, like the natural world, is subject to cyclical growth, change, destruction and rebirth. On opening night I gave an informal talk, explaining my process with a slideshow, before answering questions from the public. 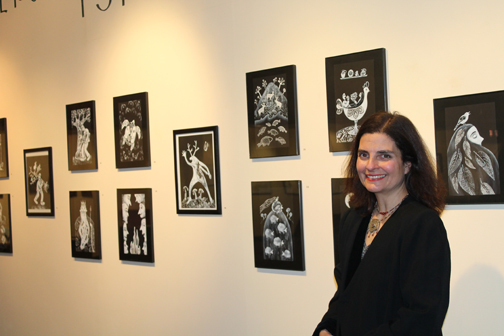 Susan Pattie, executive director of ALMA, asked how printmaking informs my illustration work and vice versa. These parallel artistic practices are distinctive yet they have common threads and feed off each other. My approach to printmaking has always been remarked for its narrative element. The difference between my print based work and my illustration, however, is that the process is more intuitive when it comes to expressing myself through printmaking. In the Icarus series, I definitely feel that my illustration experience is evident in the theme based images. Talleen Hacikyan. Detail from illustration for Aesop's Fables. 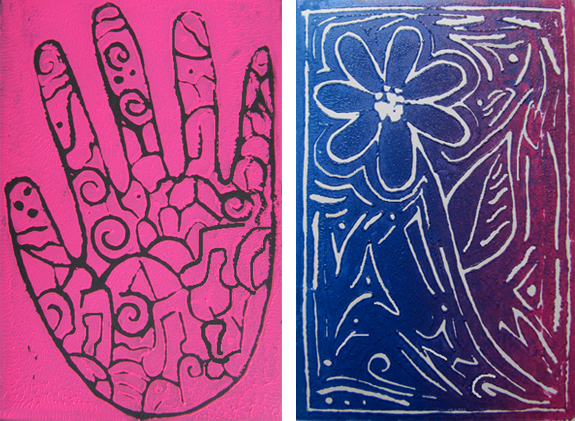 Hand printed designs using a woodblock for textile printing. As previously noted, in my illustrations I often use hand printed textures to embellish my images. Another influence of printmaking is evident in my use of black and white in Tork Angegh. The careful use of tonality is surely a result of years of printmaking, where the treatment of tones and values can make or break an image. Table with archival pigment ink jet prints of Aesop's Fables. Back wall: Tork Angegh illustrations. Exhibiting my work in a new setting, in a new city, to a new public is an enriching experience. It opens my eyes, lets me take a step back and objectively see what I have achieved and what I wish to accomplish in the future. Thank you Susan Pattie and Gary Lind-Sinanian for this wonderful opportunity. Photo of Talleen by Susan Pattie. Illustrating Harmony project: demonstrating a rainbow roll. 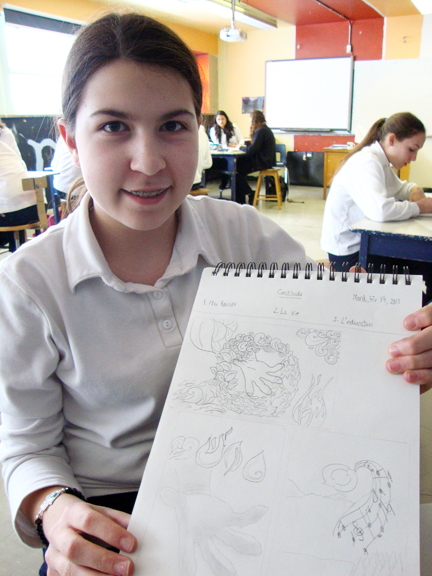 ArtsSmarts is a Canadian art education organization that promotes innovative approaches to learning through the arts. 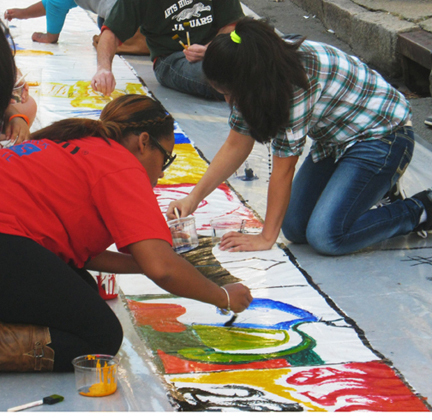 It creates partnerships with teachers and artists to collaborate on special projects. Learning engagement, student involvement, inquisitive and active participation are the key elements of ArtsSmart’s philosophy. This year I am participating in an ArtsSmarts project for the first time. Rachel Thompson, who teaches art and French at Vincent Massey Collegiate, in Rosemont, Montreal, invited me to collaborate with her. I had already given monotype workshops to her high school students over the past two years through the Culture in the Schools program and it is a pleasure to return. 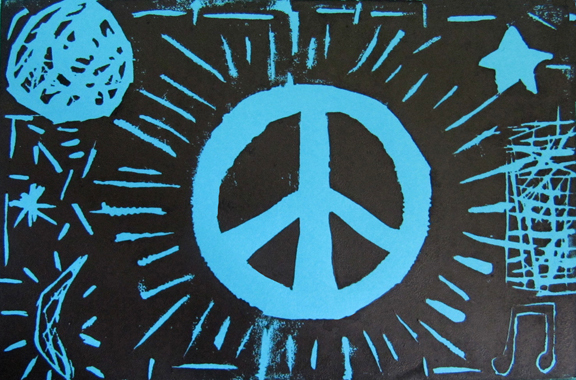 Rachel conceived the idea of a linocut printing project celebrating the theme of social harmony. 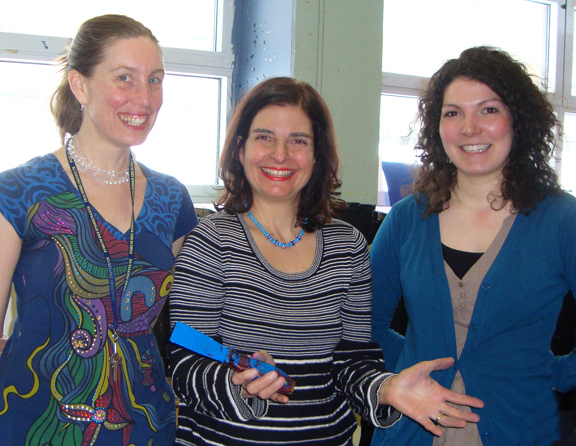 Once ArtsSmarts accepted the proposal, I met with her and Sarah Tremblay, her student teacher, to develop the project. 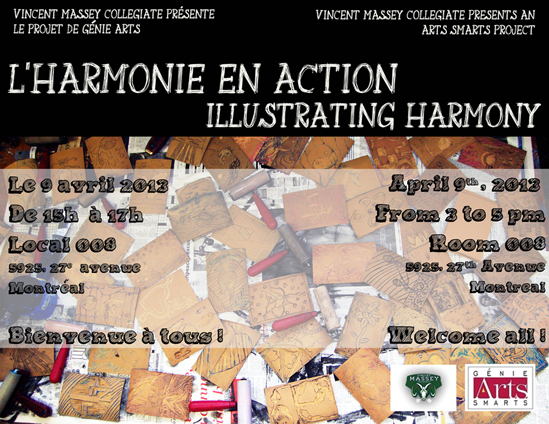 Together we designed the Harmonie en action / Illustrating Harmony project. Students are creating original linocut cards based on our theme and writing messages of appreciation, love and good will inside. They are making envelopes out of recycled paper and mailing three cards– one to a family member, one to a member of their community and another to a person of their choice. Three grade eight groups are participating. I meet each group ten to twelve times, over three months. The project will culminate with a group exhibition featuring cards, prints, original plates, tools of the trade, and a slide show. The exhibition will be held at Vincent Massey Collegiate on April 9 and it will be a chance for the students to show their prints to parents, fellow students, teachers and friends. Looking at a dry point print with the copper plate. For the Illustrating Harmony project I briefed students on the history of printmaking, showed them original prints and explained the different printmaking techniques. I introduced them to the field of illustration and we discussed how illustrators develop and perfect concepts, through the techniques of brainstorming, research and making thumbnail sketches, methods that the students put to good use. Carving, inking, retouching plate after test print. Students made final sketches, transferred them onto linoleum and patiently carved their plates. They participated enthusiastically and persevered in their work. After their first test prints, they continued carving, adding textures and enhancing lines while creating interesting effects with positive and negative space. My collaboration with Rachel and Sarah has been wonderful. 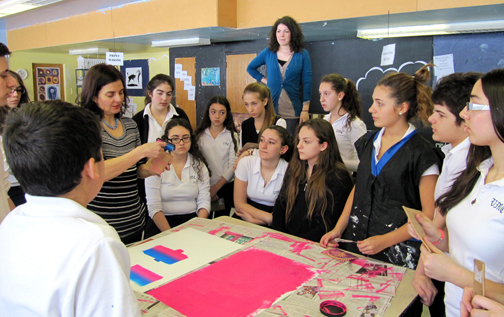 In between my visits, they worked with the students on projects that complemented my workshops. For example, the students made mandalas with erasers that they carved and stamped onto paper. 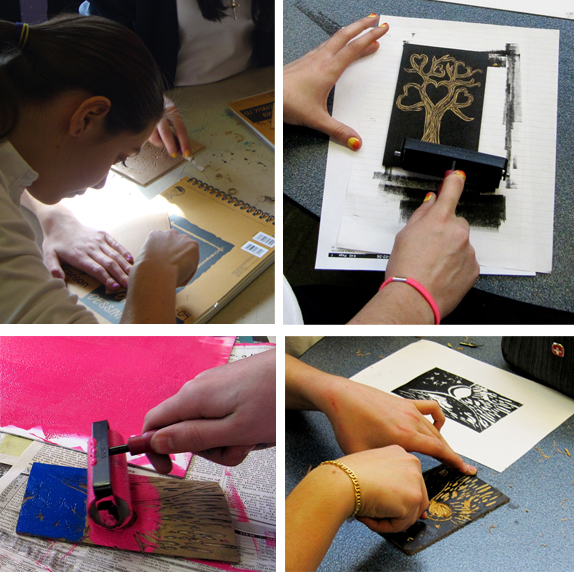 This was a fabulous way to introduce the concept of printmaking, design and texture before working on linoleum. 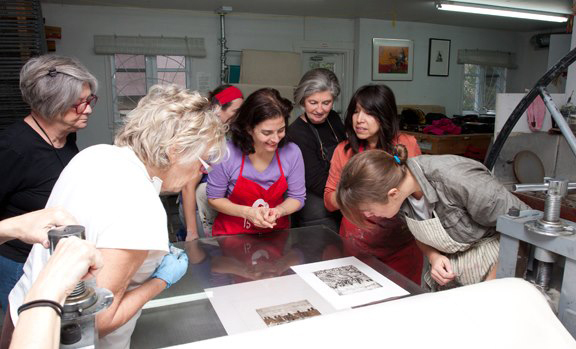 Our two printing sessions were filled with joy, discovery, and the irresistible scent of ink. 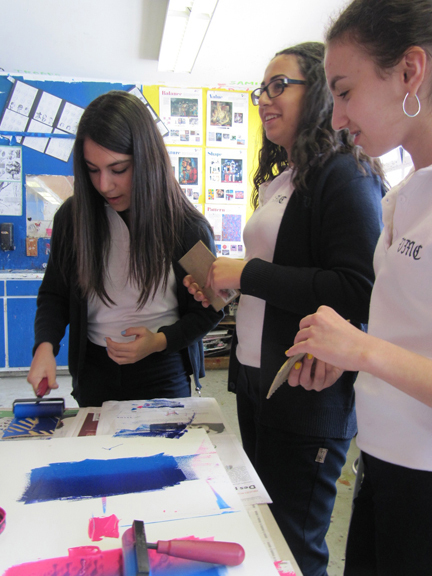 The classroom was abuzz with vibrant energy and beaming smiles as students rolled their linocuts with water based ink and printed them with spoons. The images they had been working on for weeks finally appeared before their eyes in the form of a print. Transmitting my knowledge of printmaking is satisfying. Witnessing the happiness it creates in these young people’s hearts fills me with delight. In the true tradition of the popular print, the role of which was to propagate ideas, the students will spread their images and messages of peace, love and harmony and perhaps use the mailbox for the first time! Thank you Rachel Thompson, Sarah Tremblay, Julie Hobbs, Program Advisory Committee Chair of ArtsSmarts, and to all the students who participated this project. 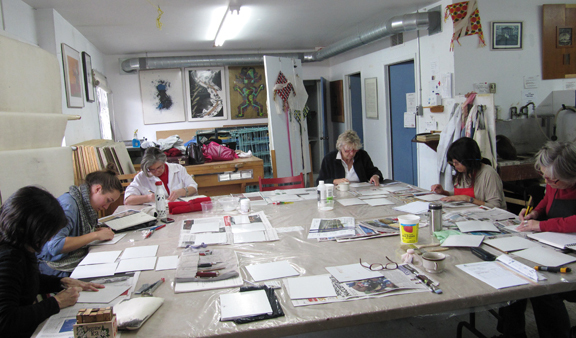 In November, I gave a monotype workshop at Atelier Circulaire. 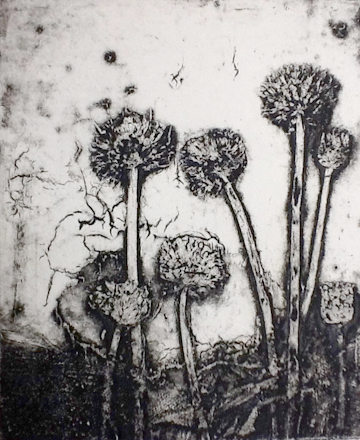 The very nature of this versatile and direct printmaking medium sets the stage for playful, expressive energy. From day one, this was the case in my group of eight enthusiastic women. The workshop took place over four full Saturdays. In between my demonstrations, participants had ample time to explore and experiment. We devoted our first class to the basics of traditional black and white monotype. The voluptuous beauty of black never fails to seduce, no matter how anxious students are to dip into color. On day two we plunged into the joy of color. In the morning I showed how to mix colors on and off the plate and how to create a palette of colors. 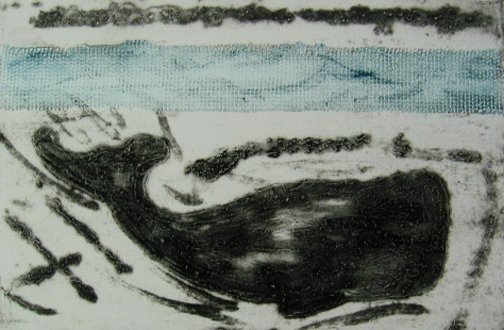 After lunch, I showed how to build up and layer monotypes with multiple plates. On this day we had the pleasure of being assisted by Celia Vara, visiting from Spain. It is impossible to write a blog about this particular workshop without elaborating on our elaborate lunches. Since it is hard to find open restaurants in the the neighborhood on Saturdays, my students organized a potluck lunch on day two. Each dish was prepared with TLC and the delectable sensations they created in our palates prompted us to repeat the potluck experience every week. The healthy, mostly vegetarian dishes and the absence of alcohol, went a long way to energizing us for a full afternoon of creative work. Denise Faucher. Monotype with chine collé of digital print. Carole Latulipe. Monotype with chine collé of digital print. 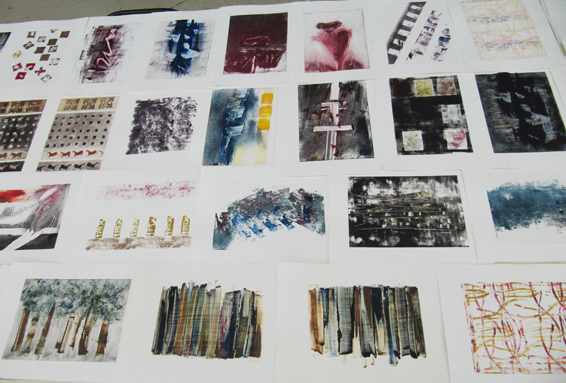 Experimental took on a whole new meaning on day three as we dived into the world of chine collé or print collage. 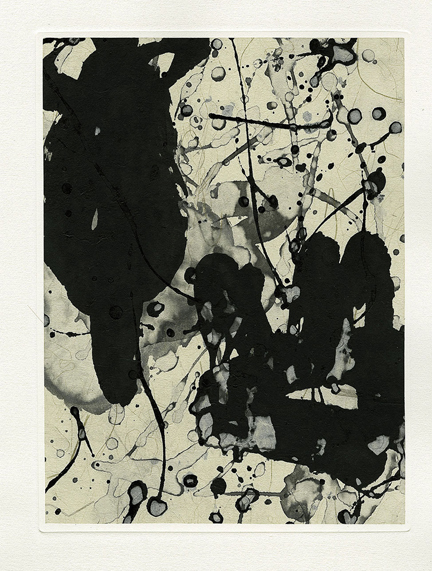 With this technique, artists can combine monotype with elements of other works on paper such as drawings, paintings, digital prints, photocopies or other printed matter. Each week I raised the bar a bit, providing new challenges to work through. I strive to expose students to a vast array of possibilities in order to provide the tools for further independent exploration when the workshop is over. Each participant brought paper elements to class and the diversity of approaches created a learning experience for all, including myself. Renée Gelinas. 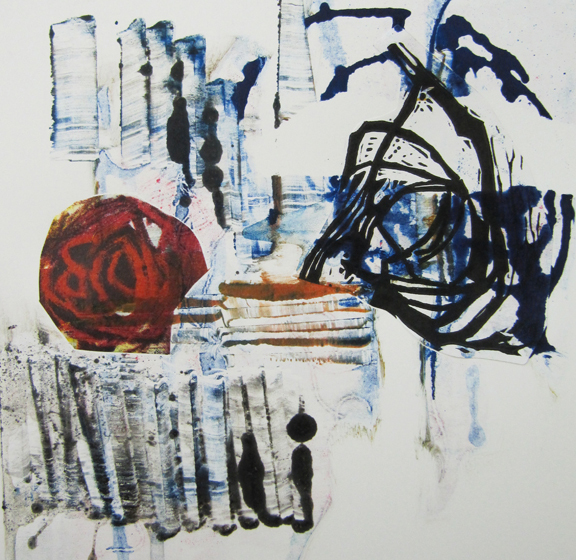 Monotype and collage with Akua ink. Our last class was particularly effervescent. Up to this point we worked with oil based printing inks. I started this day with a demonstration of Akua, water based printing inks. These non-toxic, slow drying inks have a very different feel to them than their oil based counterparts. I wanted students to know that these inks exist and provide a very viable alternative. Students had the choice to work with them or to pursue anything else that we had covered up to that point. One student totally fell in love with the handling and look of Akua ink. Another student created marvelous effects by layering gold Akua over black oil based ink, while another student created unique textures by spraying water over an Akua roll up. We ended our workshop on a high note with a class exhibition. 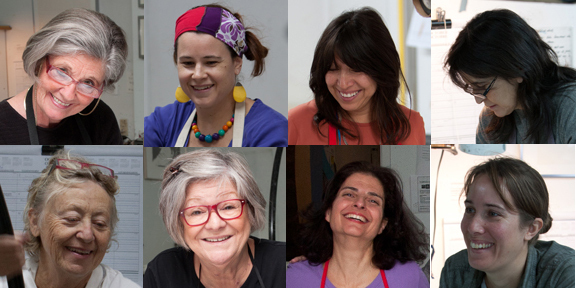 Not only are these women fabulous cooks, they are prolific artists! After cleaning up and putting prints between blotters and boards to dry, we indulged in admiring everyone’s work, this time with a glass of wine in one hand and a piece of chocolate pear pie in the other. Left to right: Carol Latulipe, Monique Duplantie, Marie-Claude Mirandette, France Houle, Manon Gauthier Denise Faucher, Carmelle Pilon, Renée Gelinas, Talleen Hacikyan. 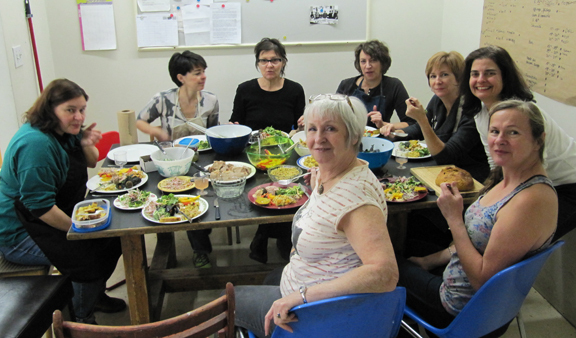 Everyone agreed they would miss my class, in no small part for the potlucks, which is good luck for me because many of these women have signed up for my next class at Atelier Circulaire, collagraphy in February and March. My tummy can hardly wait! Merci à toutes les artistes pour avoir participé à mon stage! Steamroller Steve and the Quarter Mile Print. The Quarter Mile Print: It’s a Family Affair took place in Newark, New Jersey on Saturday October 20, 2012. Over two hunderd people gathered in Washington Park to participate in this printmaking extravaganza that was a highlight of Open Doors, sponsored by the Newark Arts Council. 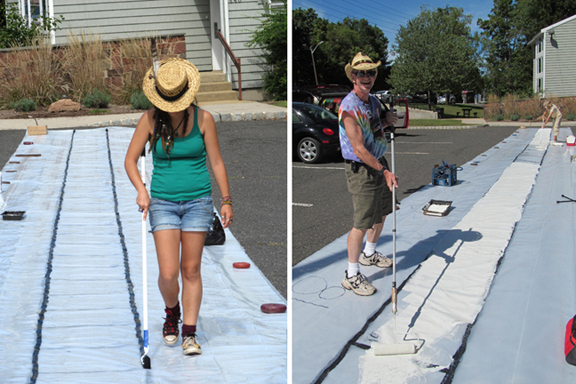 The public and professional artists created monotypes along a plastic sheet, measuring a quarter of a mile. The monotypes were printed onto paper with a steamroller. 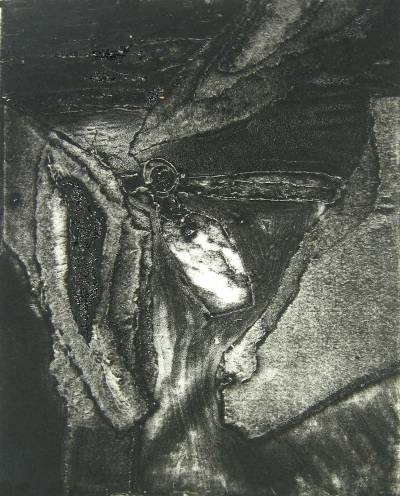 Monotype is the most direct printmaking technique. Printing ink is applied to a plastic or other smooth, non-absorbent surface and printed onto paper, usually with a printing press. For the Quarter Mile Print, participants used high quality supplies–Akua water based printing inks and 800 sheets of Canson Edition paper, generously donated by the respective companies. Steve McKenzie, artist, printmaker and manager of the Arts Workshop at the Newark Museum, organized the Quarter Mile Print. “I really wanted to do a project that the community of Newark could participate in and felt that doing a print that would be a quarter mile long would grab people’s attention and bring people together. I have been experimenting with non-traditional forms of printmaking all my life and the Quarter Mile project is only the latest iteration.” says Steve. One day in the mid-’80s, as Steve watched a paving crew put finishing touches to a road, “a light bulb went on.” He realised that the steamroller could be used as a press to print large works. Soon after, Steve bought his first steamroller for 600$. The cherished vehicle has since disappeared (that’s another story) but he still has the receipt. 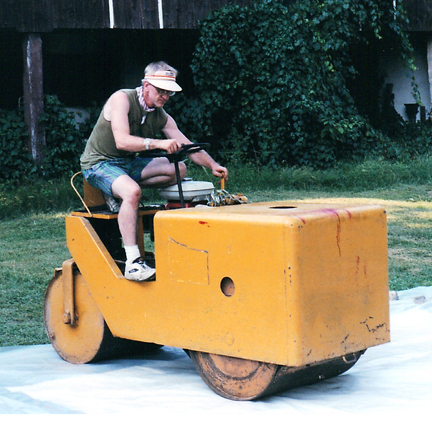 This was the start of the artist’s adventures with “roller printing”, as he calls it, which occurred before the current wave of steamroller print projects. Every summer, for ten years, he went to Camp Rest-a-While in Salford, Pennsylvania, not to rest, but to create an oversize monotype. 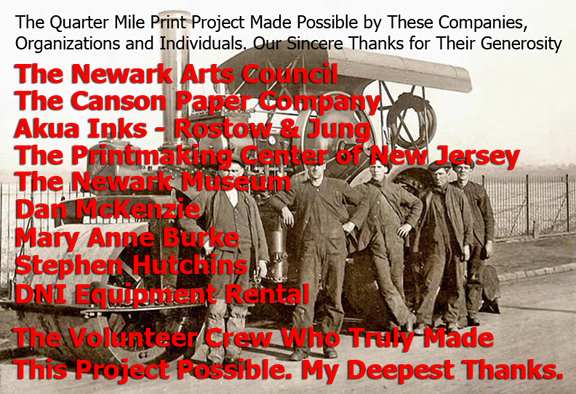 In 1999, Steve was part of the Printmaking Council of New Jersey’s effort that established the Guinness record for the biggest monotype–1000 square feet. He helped organize the project, that used his method of printing from Tyvek, the plastic insulating material used in home building. This man had the experience, vision and drive to organize the Quarter Mile Print. Since I volunteered to help on printing day I received email updates addressed to volunteer crew and witnessed the magnitude of coordinating this project. The volunteer crew had two hands-on tech days. 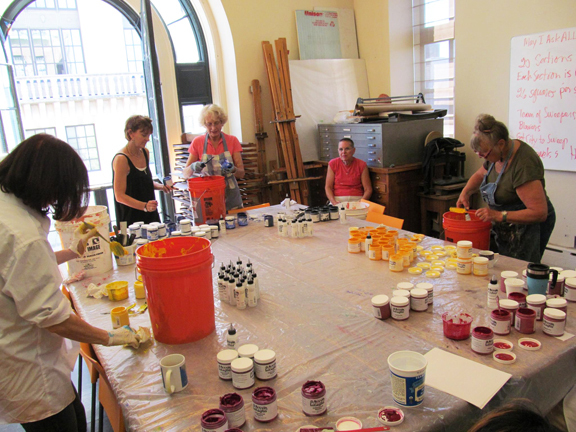 Susan Rostow, of Akua Inks in New York, showed the crew how to mix the ink with blending medium to obtain optimum viscosity and demoed how to work with the water-based ink. The crew also had a practice printing session at D.L. 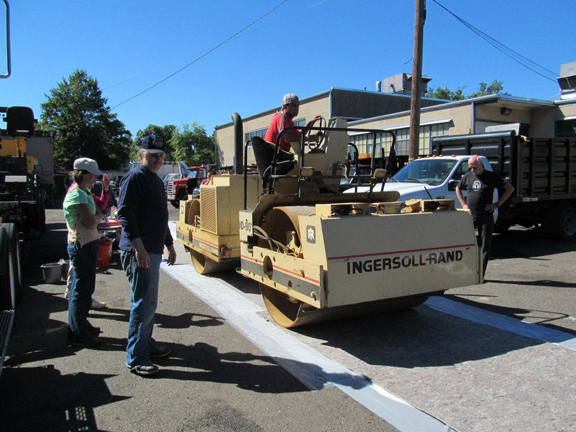 Paving Contractors, in Belleville, New Jersey. From the first meeting to recruit volunteers in March 2012 at the Printmaking Center of New Jersey to the Big Day on October 20, Steve faced many challenges as he strived to cover “every last detail.” Whether it was buying and preparing material, seeking sponsors, screen printing t-shirts for the crew and banners for the city, or drumming up publicity. The biggest challenge was when the event was postponed for two weeks due to rain. This resulted in losing a third of the crew, including myself, losing the original After Print Exhibition venue and last but not least losing the donated steamroller that was scheduled for a paving job on the new date. 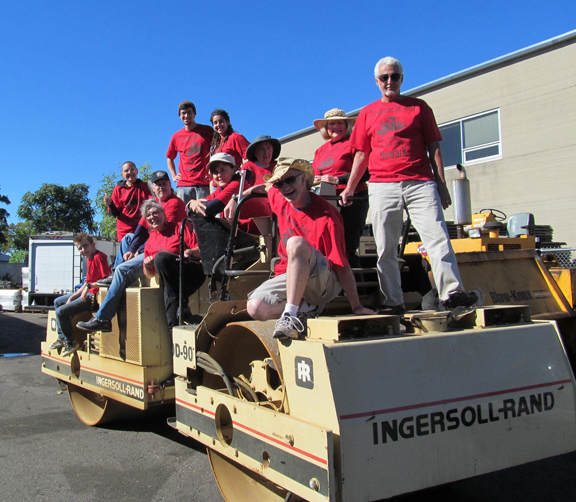 Two days before the event, after relentless knocking on doors, Steve rented a beautiful DD-24 steamroller from DNI Equipment Rental, who waived the 150$ delivery charge and threw in an extra day. For Steve the highlight of the Quarter Mile Print was “seeing people busily creating their monotypes and realizing that the project had come to fruition. One officer, a Mr. Aviles, even participated, drawing a cool picture of a squad car with a red light on top. It was neat!” Steve McKenzie is a people person. He thrives on taking art out of the studio and into the street where it becomes a communal process and a medium for interacting with the public. 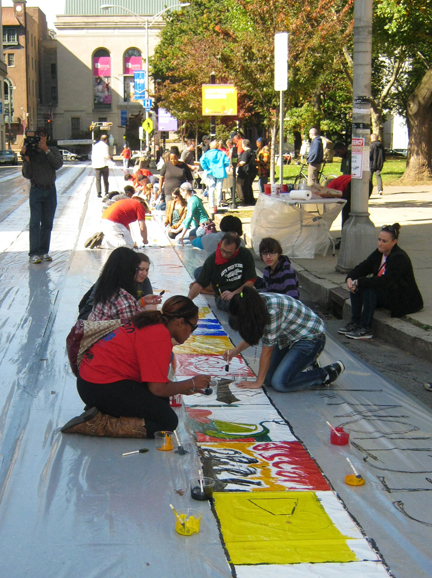 In May 2013, the public will be able to view some of the work created during the Quarter Mile Print Event. 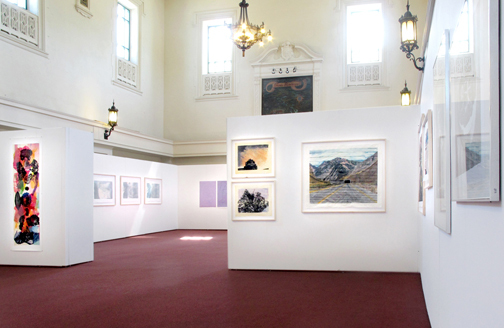 Two hundred monotypes will be exhibited at 1978 Arts Center in Maplewood, New Jersey. Steamroller Steve’s talents aren’t limited to printmaking. No, he does not pave parking lots, although I would not put it past this man who used to operate tractors when making snow on ski hills during grad school. 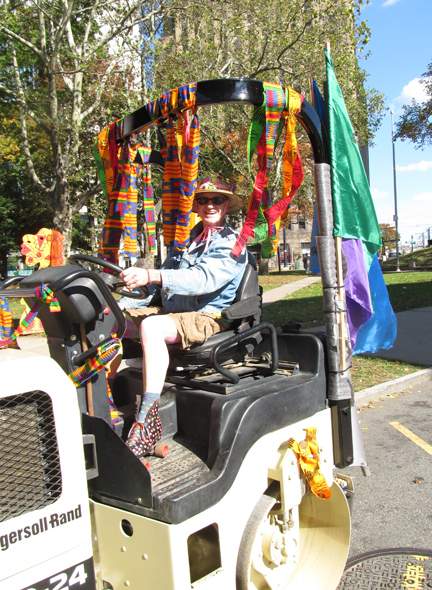 On Sunday, the day after the Quarter Mile Print, Steve decorated the steamroller, slipped into appropriate parade apparel that included custom painted roller skates, and drove the DD-24 through downtown Newark traffic to the Creation Nation Art and Peace Parade, another Open Doors event. This time there was no paint under Steve’s skates but once again there was joy in his heart and smiles on spectator’s faces. I’d say he managed to amuse and enrich quite a few people that weekend! Thank you Steve for the interview and photos. On the weekend of October 20 and 21, 2012, I had the pleasure of giving a collagraphy workshop at Atelier de l’Île, in Val David, Quebec. Val David, located in the heart of the Laurentian mountains, is an artists’ village. With major cultural events such as 1001 pots and the Symposium of In Situ Art held at Les jardins du Précambien, Val David offers an effervescent cultural scene where art and nature interact. The village is home to ceramists, painters, writers, glass blowers, pewter artisans, textile artists and printmakers. 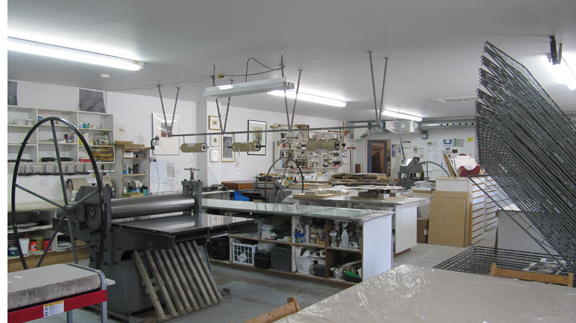 Founded in 1975, Atelier de l’Île is a well-equipped and active printmaking centre where over four hundred artists have worked over the past twenty-five years. It has always favored exchanges between artists of different disciplines and has published several artists’ books. This summer I was an artist in residence at Atelier de l’Île, where I started my own artist’s book, based on my experience in Val David. 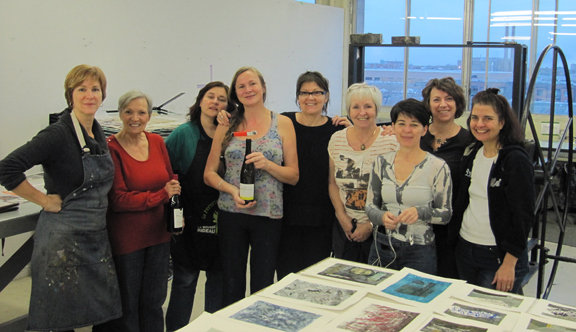 I enjoyed returning this fall to teach collagraphy to a group of seven wonderful women. The dynamics in this group were incredible. Some of the women were members of the studio and few came from the outside, including my Guatemalan artist friend, Morelia. 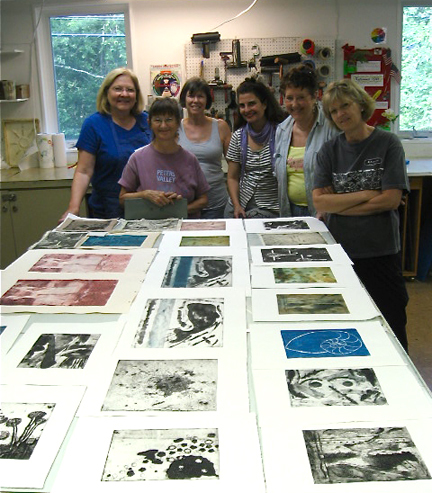 They were all eager to learn or perfect the collagraph technique and there was a genuine camaraderie in the group. Two-day printmaking workshops are intense. Participants absorb information and produce a lot of work, in a fluid and efficient manner. With the limited time frame, they are on a creative high. There is no time or place for creative blocks. I always invite participants to approach their first piece intuitively, without preoccupying themselves with image. This first plate is the precious place where they can feel the medium, the tools, the language and pace of this magical technique called collagraphy. Day one is for making several small plates. I show all the basic techniques for working on plates: engraving with Xacto knife and dry point, ripping, building up textures with acrylic gel medium and plaster and collage with tissue paper, leaves, lace, cloth, egg shells etc. Last but not least, I show how to create dark velvety tones with carborundum power, a bit harder to control, yet never fails to seduce! By the end of the day, the artists had time to print one black and white print, leaving them with a concrete impression of their work. Day two is a high energy printing day. I concentrate on printing technique and show methods passed on to me by master printers, from cutting and wetting paper, to wiping with tarlatan and for more advanced students, printing with two plates. I introduce color and elaborate on mixing techniques and on how to create a palette for multi-color prints. It is always a joy to see faces light up each time someone lifts a print from a plate. Everyone circles the press and a warm feeling is generated not only by the artist of the print but by the whole group, as if the newborn print was the result of a group effort. 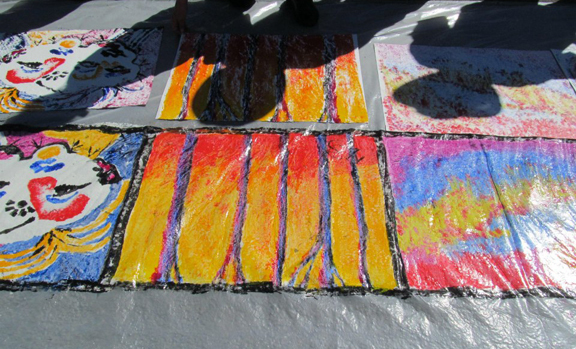 Each print made during a workshop has been shaped by the special energy created through group interaction. The communal experience passes through each individual, manifesting in unique images that in turn have the power to create a collective emotion. 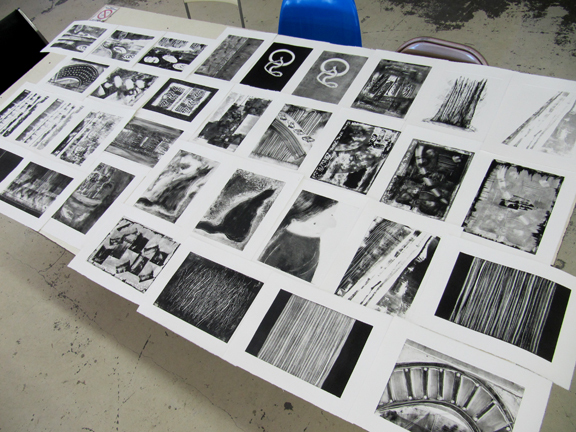 We ended the workshop with a display and commentary of all the beautiful collagraphs printed over the weekend. This was followed by a wonderful slideshow put together by our photographer, Cristian Moraru, visiting from Toronto and an artist in residence at the International Writers’ and Artists’ Residence in Val David. It’s been three weeks since I gave the workshop and former students are emailing me to say that they are making new collagraphs. Marilyse wrote, Ton cours fait des petits, your workshop is having babies, which makes me one proud mama! Thank you Marcel Achard and Atelier de l’Île for inviting me to teach this workshop. Thank you to all the participating artists. Merci! Photos of artists by Cristian Moraru. Thank you. 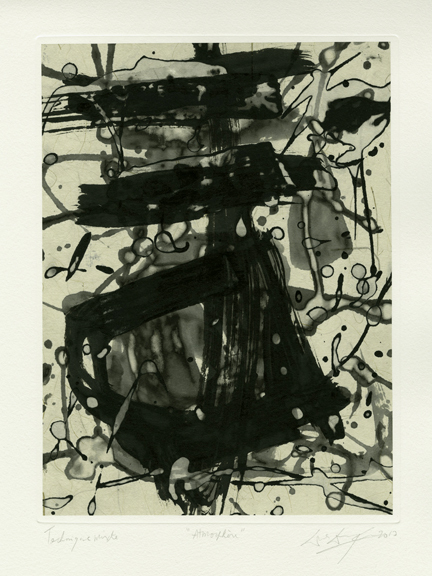 Wah Wing Chan will be exhibiting Noir sur noir, his latest series of mixed media on paper at Galerie McClure at the Visual Arts Centre in Montreal from November 30 to December 21, 2012. The vernissage will be held on Thursday November 29, 2012 at 6pm. The public is welcome. Wah Wing Chan at Atelier Circulaire. Wah Wing Chan was born in 1960 in Macau, the former Portuguese colony. In 1972, he immigrated with his family to Montreal. He was introduced to printmaking at John Abbott College (1985-1987). 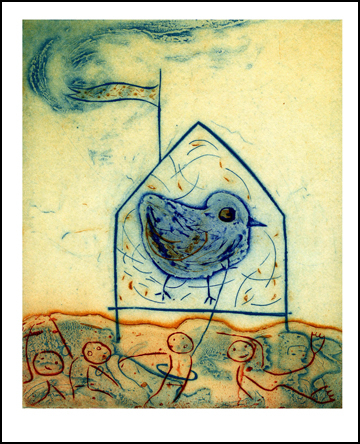 Wing later completed two Bachelors of Fine Arts degrees at Concordia University, first in Studio Arts, with an emphasis on drawing and printmaking (1987-1992), after which he earned a Specialization in Printmaking (1992-1996). 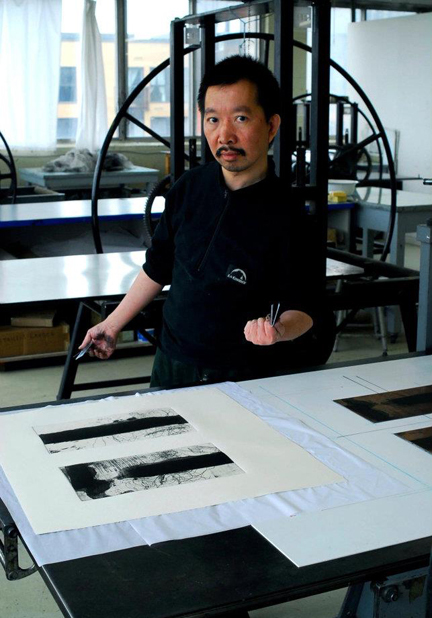 He has been a regular member of Atelier Circulaire printmaking studio since 2000. His work can be found in private and public collections in Canada, China, India, Portugal and Korea. I have had the pleasure of working with Wing at Atelier Circulaire since he joined the studio. Through the years I have witnessed his dedication to his fervent art practice. Working side by side with many artists, it is fascinating to observe each person’s approach to making art. In Wing’s case, I am struck by his steady pace and strong presence at the studio. Wah Wing Chan, Gravité, mixed media on paper, 19 x 14 inches, 2011. Wing’s work is powerful, striking and impeccably executed. When I visited his last solo show at Wilder and Davis in 2011, I fell under the hypnotic spell of his mixed media work. Each image captured my imagination and solicited its own mood. I enjoyed surrendering to the free association of narrative and emotion conjured by each piece. This show was a prelude to what we will be treated to at Noir sur noir at the Visual Arts Centre. Today on his Facebook status, Wing posted, “I adore spontaneity, providing it is carefully planned.” This wraps up his approach to image-making, a delicate balance between heart and mind. I met Wing at Atelier Circulaire’s kitchen for a friendly interview, while we enjoyed a pot of brown rice tea, brewed by the artist. 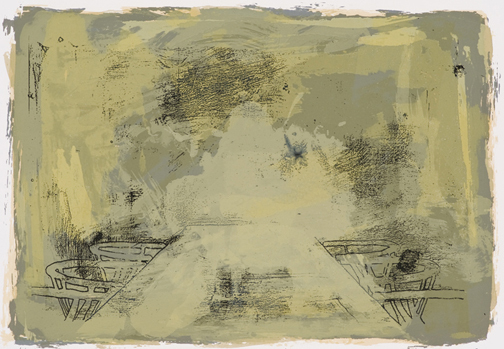 Wah Wing Chan,Atmosphere, mixed media on paper, 19 x 14 inches, 2012. Talk to me about your upcoming exhibition at the Visual Arts Centre. I’ll be showing my latest work in this exhibition called Noir sur noir. It’s a two-man show and I look forward to meeting a new audience. My pieces are done with acrylic paint on Tatami paper, that I chine collé to Hahnemühle paper. Basically I work with two types of black, Animal Black and Carbon Black. 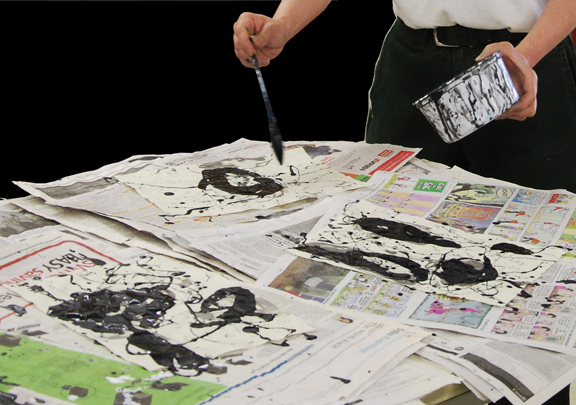 Wing applies acrylic paint to Tatami paper. I’ve watched you work on this series at Atelier Circulaire and you use a very unique technique. Can you explain your process? I apply acrylic paint to Tatami paper with a Chinese brush. I work in layers, a minimum of two, a maximum of five. Between each layer, before the paint dries completely, I rinse the paper with hot and cold water. It’s important to be patient because if I rinse too soon there won’t be any paint left on the Tatami. When I paint my first layer it’s very spontaneous and loose, this is my background. I look at it and ask myself how to apply the next layer, so that it is not repetitive and adds an interesting element. When the painting is done I apply two layers of rice glue to the back of it. Then I pass the Tatami through a press with a plastic plate so that it bonds to dampened Hahnemühle paper. The piece is then placed between blotter paper, under pressure, for a few days to dry flat. Is your spontaneous and reflective approach to brushwork related to calligraphy? I can say no, but then again, it’s the hand that was trained as a kid in calligraphy. In school, in Macao, we had to repeat Chinese characters several times. Nobody liked doing that. Some people may see a connection between my work and calligraphy. I want to move away from it. My influence is the environment around me. Wah Wing Chan, Hystérie, mixed media on paper, 19 x 14 inches, 2011. My subject matter is man-made or nature formed marks. I look for marks on floors, walls etc. Most people experience their daily lives ignoring them. I want to bring these underdog elements to light. My job is to showcase them. My eye can be drawn to a crack in the middle of the street, a ball of tangled wire, a water stain on the side of a wall, a crinkled-up rusted piece of metal. I’m always searching for the unobserved, unseen, neglected visual elements that surround me. In using these mundane visual elements, I want to draw inspiration from them, create my own imagery and not to represent them exactly as they are. Why and how did you become an artist? When I first arrived to Canada from Macao I was 12 years old. I remember sitting in class, not understanding what was going on and doodling a lot in my workbooks. 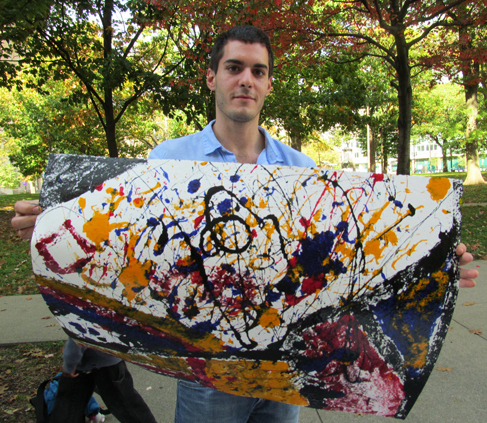 Later, I was attracted to abstract art making. Would you say that later when you started to practice art, you subconsciously associated the creative act with the comfort and security that you experienced as a young boy when you drew away in your workbooks? Wah Wing Chan, Mutation, mixed media on paper, 19 x 14 inches, 2011. Tell me about your art training. I didn’t study art right away. First I got a degree in Retail Management from Dawson College. I dabbled a bit in drawing before and after that. I worked for a while in public service related jobs at Multi Mag, and Chinese and Japanese restaurants. Then I studied Fine Arts at John Abott College where I sampled drawing, painting and printmaking. I found that I could best voice my imagery through printmaking. I went on to study at Concordia University where I completed two Bachelors of Fine Arts, one in Studio Arts and a Specialization in Printmaking. You’ve been a member at Atelier Circulaire for twelve years. 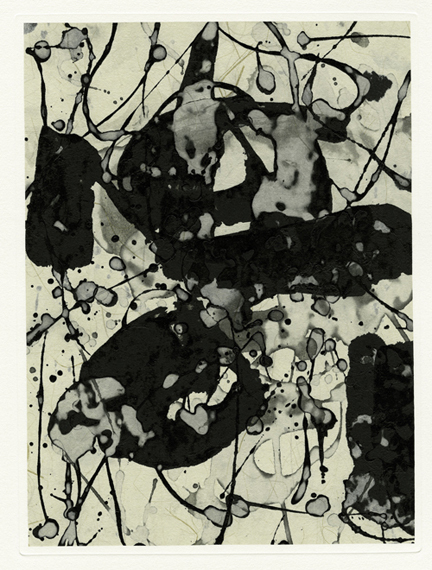 How has this printmaking studio influenced your work? 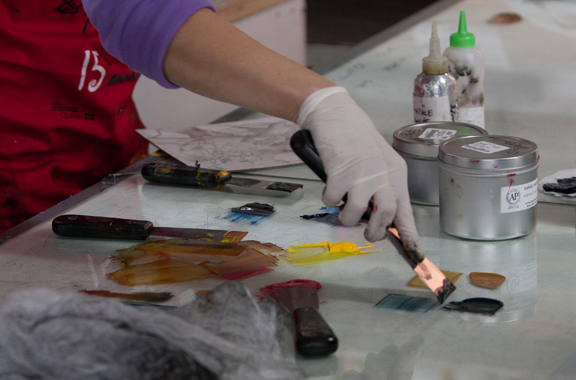 At Atelier Circulaire everything is under one roof: lithography, etching, digital printing and collagraphy. This let me spend periods of time with different techniques and this led me to my own experiemntation where I mix techniques. What would you like to do in the future regarding your work? I would like to go back to etching, but larger etching. I want to work in color with multiple plates. I also want to make more simplified images, less chaotic. Don’t get me wrong, I still like chaotic. N.B. Wing recently published a heart-warming essay of his early days in Canada as a recent immigrant, in The Gazette. Photo of Wing at the press by Armando Rafael. Photos of artwork by Wah Wing Chan. WaylonHem dans Happy Birthday Blog! DyeptMikhail dans Happy Birthday Blog! BradleyRit dans Happy Birthday Blog! Lloyd dans Happy Birthday Blog! Monotype Workshop with Akua Inks. Atelier Circulaire and Friends Visit New York. Illustrating Aesop’s Fables For Today’s Children. 44 requêtes. 0, 139 secondes.